easter fun day bellerive, a photo by james veltmeyer on Flickr. There is an AFL match at Blundstone Arena Bellerive on Easter Sunday. North Melbourne vs Greater Western Sydney. So we decided to have a Easter Sunday Fun Day, so that when people walk pass us on the way to the AFL we can try and engage them and let them know we are here. 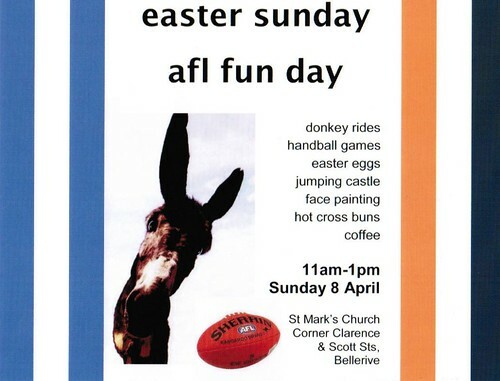 There will be donkey rides, face painting, handball through the hole game, jumping castle, hot cross buns and more. The SMBC mission team last week, letter boxed dropped and door knocked the area around the church.